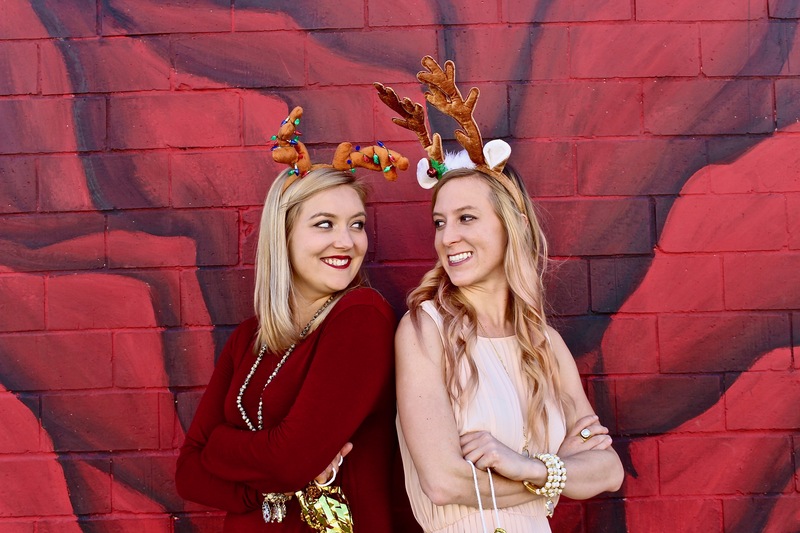 Tis the season for tacky sweaters, spiked eggnog, and beautiful (and/or cheesy) holiday cards. If you’re planning on sending out cards this season and didn’t plan a head and take bomb picture wearing Santa hats in front of the pyramids in Egypt on your trip over the summer, have no fear! Houston is a magical place to snap a pic and with a few of our tips you can have a memorable, stand-out card in no-time. Since this may be the one and only time you send a snail mail letter all year, make the picture count. 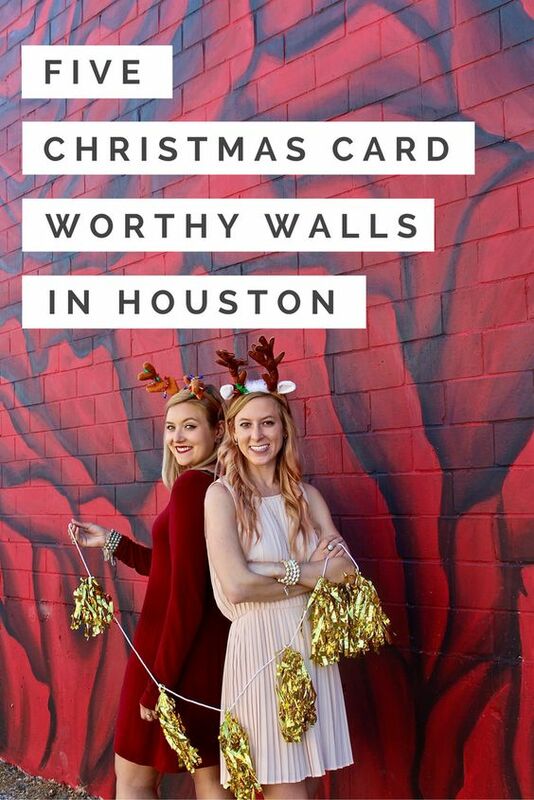 Grab your roommates, your boyfriend, your dog, your girl squad and check out these 5 fantastic Christmas-card worthy walls in Houston. 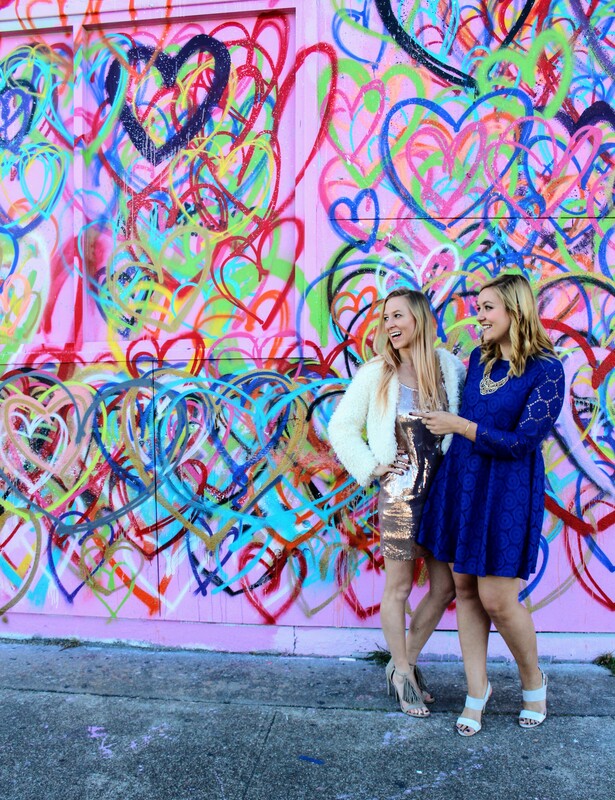 The Houston art scene is popping, constantly changing and really brings the city to life! 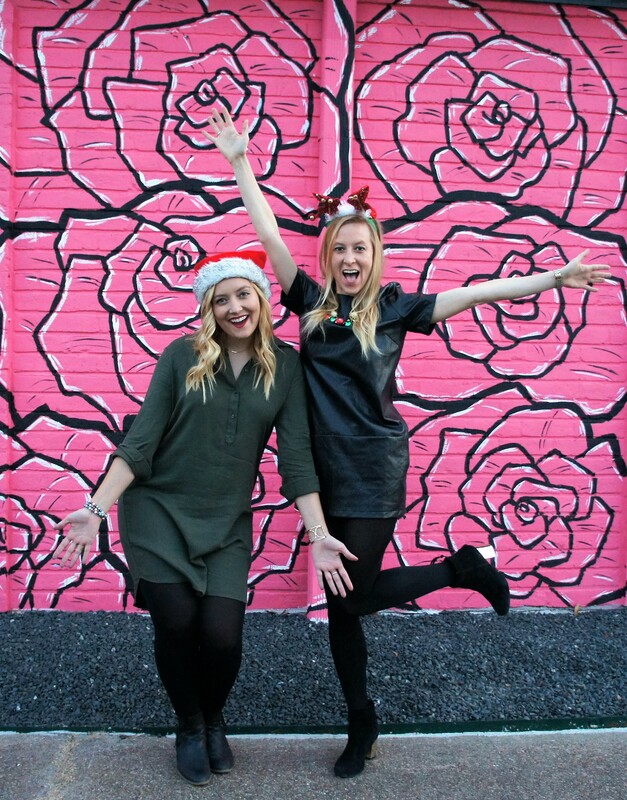 We previously blogged about 10 Must See Houston Walls, but now we’ve created a new list with the holidays in mind! Below check out the locations of our favorite holiday-card worth walls and what makes them awesome! Why it’s awesome: One of the latest additions to the Houston art scene, this giant floral beauty popped up during the HUE Mural Festival in October and is located on one of the St. Arnold’s Brewery warehouses. The artist, Tyler Kay, is a graduate of Seven Lakes High School and University of Houston. Kay paints floral arrangements to show that there is beauty in everything and how important it is to–if you will—take time to smell the roses. 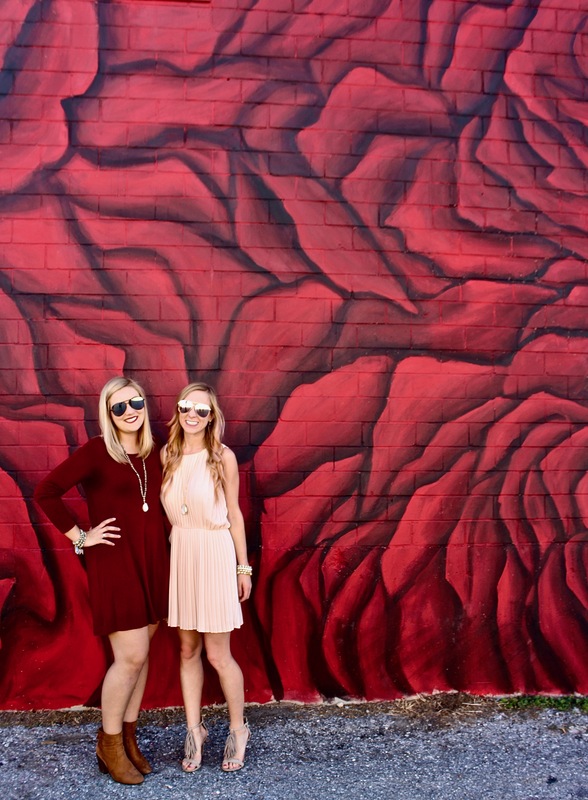 Photoshoot tips: The wall is red and black but acts as a fairly solid color backdrop. We chose to wear blush and burgundy when we went, but cream, navy, denim colors would all work as well. This mural is great to bring all of the props. Since the background is pretty simple, you can get crazy in the details without making the photo seem too busy. We brought all sorts of things like Santa hats, reindeer eat, tinsel, and even a strand of Christmas lights. I’d love to come back here at night and shoot with a full Christmas tree set up on the sidewalk! 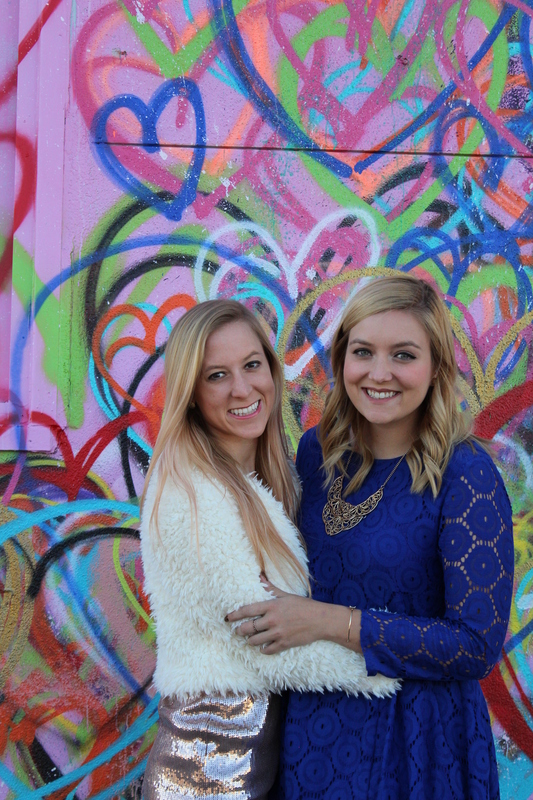 For more tips on how to use props in a photoshoot, see How to Have a Photoshoot at the Sugar & Cloth Color Wall. When to go: The wall faces east, so you’ll want to go in the late afternoon when the sun is behind the building. 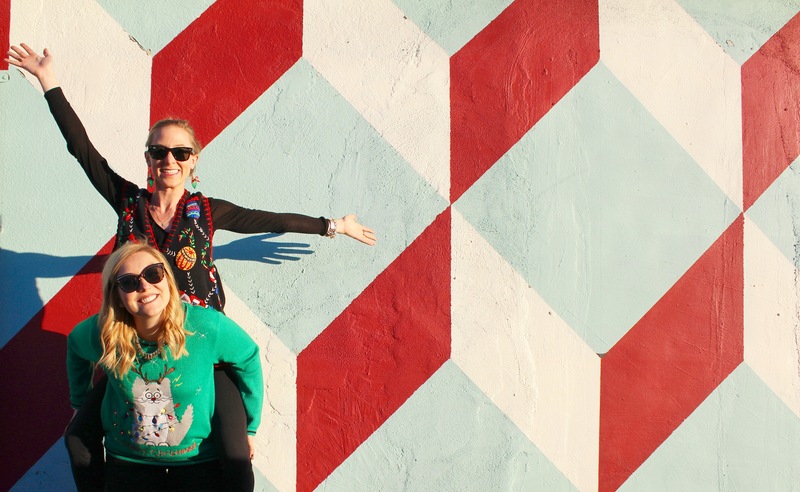 Why it’s awesome: This mural is a giant rainbow doodle from your middle school notebook. It’s full of color, life and love. And let’s be real, we can always use a bit more love in the world. Also, this wall is in a super fun area in EaDo with a bunch of different murals around the block. Be sure to check them all out! Photoshoot tips: Layer on all of the bling. Or well, that’s what we did! 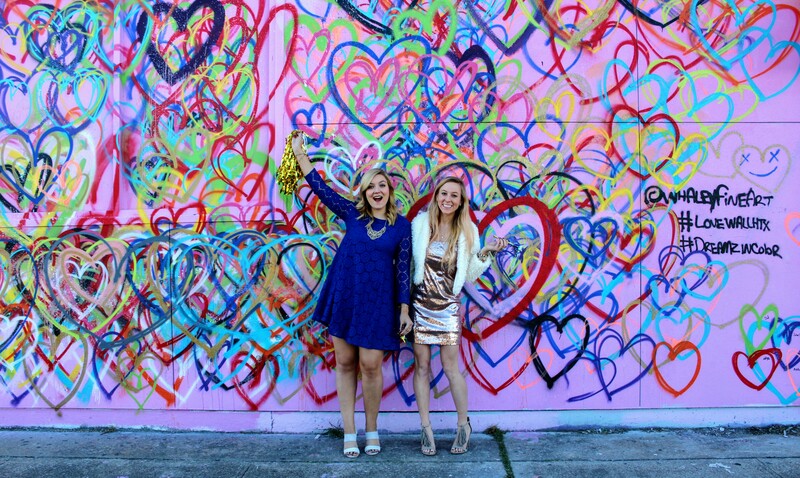 We took a NYE approach and wore all of the glitter and sequins. Stick with solid color clothing so you don’t get lost in the busy pattern behind you. 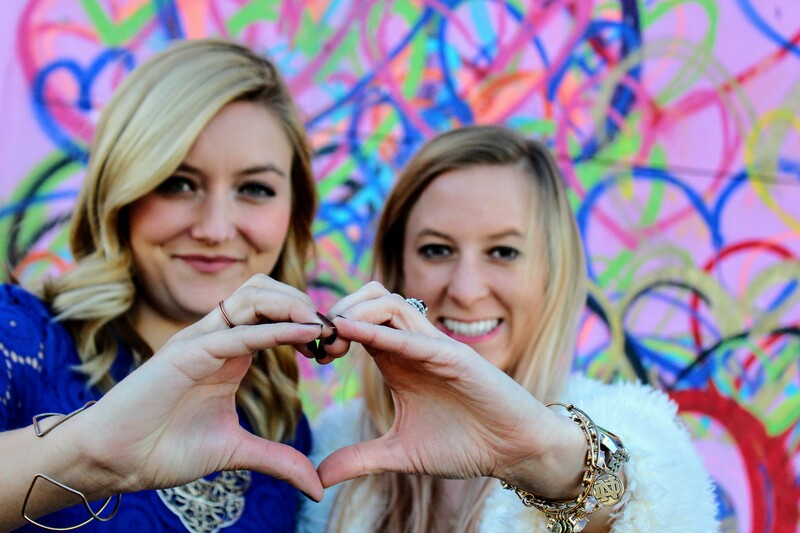 If you do snap a pic here, be sure to tag #lovewallhtx when you post! When to go: Late afternoon so the sun is behind the wall. There is an annoying railing stuck in the middle of the sidewalk, so if you go in the middle of the day you risk getting the shadow in your photo. Why it’s awesome: Located in the First Ward or “Art District” of Houston, this mural spans a loooong block of building space near Winter Street Studios on Sawyer and is filled with all sorts of colors blended and swirling together like waves in the ocean. Photoshoot tips: There’s a delightful spot in the painting where the red and green waves all meet, which is the perfect color combo for Christmas time. Due to the narrow space of the sidewalk and the proximity to the road, this spot is less about the wall and more about you. Head here if you’re looking for a tighter, family photo-esque shot. You can also stand on the other side of the street and get a nice panoramic view. It takes a bit of patience to snap shots when the cars are passing through, but it’s possible to get an impressive pic! When to go: Taking pictures here can be a bit tricky since the mural is located on a fairly busy street. Wall faces east, so late afternoon when the sun has set is best for the lighting. But early in the morning on a weekend when there is less traffic might give you more flexibility with angles. Why it’s awesome: It’s brand new! This beauty by Brian Dibala was painted in October 2017. Its a large wall (with some windows) with an ombre collection of blue, purple, pink and magenta roses. We selected the bright roses in the middle that most closely accentuate the holiday colors. They almost look like poinsettias, no? Photoshoot tips: The wall is on the side of STRETCH Montrose studio. We were able to park our car on the side of the road and set up the tripod inside the vehicle. The street is fairly low trafficked, so there were few interruptions or nosy passersby when we were doing the shoot. When to go: Wall faces north. I recommend going either early morning or early evening, so the overhead sun doesn’t cast strong shadows. 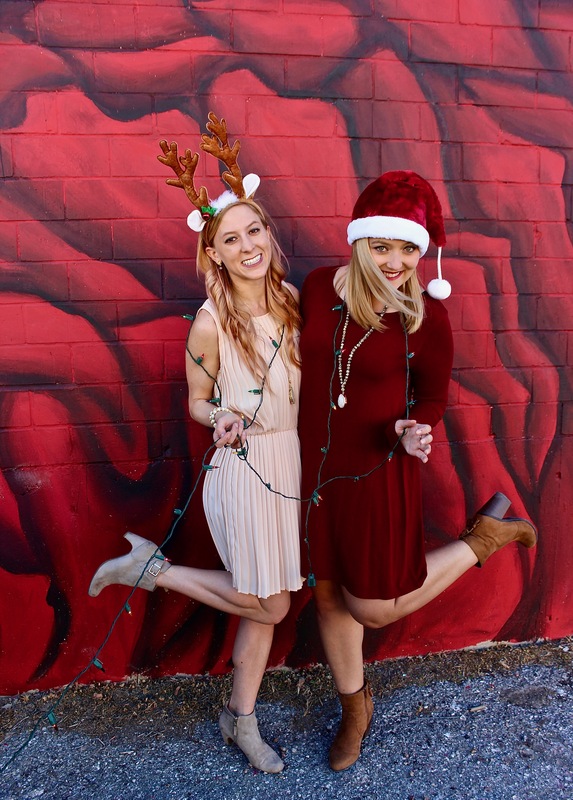 Photoshoot tips: Tis the season, to deck the halls and doll yourself up with every Christmas article of clothing you have. We went with tacky Christmas vests, sweaters that light up (Meowy Christmas everyone! ), Christmas light bulb earrings, jingle bell rings and more. Additional props that could be fun here include Santa hats, reindeer ear headbands, and/or matching argyle sweater. When to go: Early morning! We went in the afternoon with full sun and struggled with the shadows for sure. There were also a bit of cars parked along the side of the road which made it a bit more difficult to get full body shots. 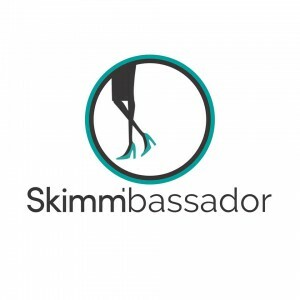 Zazzle: This site has become a personal favorite of mine. They have great templates that are super customizable. I tend to opt for the postcard layout so that I don’t have to mess around with an envelope—plus postcard stamps are cheaper! In their online tool, you have the option to choose a template, upload a photo (or a few) and add text. They’re always running promotions (check the top bar of your screen for the latest deal) and give discounts when you buy in bulk. You can also make fun custom gifts like mugs and ornaments! Paperless Post: Known for their email invites, this site has by far the most gorgeous selection of card templates ever, including some from well-known brands like Kate Spade and Oscar de la Renta. You can create holiday party invites easily on the site, and if you fall in love with the invitation you can create a physical invite as well. The site also even offer professional help to choose a design. Just send over a few photos that you’re deciding between and their design team will mock up some options for you to review for free. Plus on Cyber Monday they’re having their biggest sale of the year: 35% off site wide + free shipping! ALSO! Check out the segment that we did on KPRC Houston Life on November 28, 2016. Thank you to Beehive Houston for styling us during our appearance! Thank you to Iridescent Photography and Annie Schwendler for the beautiful photos and Burdlife for the fantastic jewelry. Tags: Christmas, Christmas 2016, Christmas Cards, color wall, DIY, EaDo, graffiti, Invitations, Iridescent Photography, Montrose, mural, Paperless Post, photoshoot, The Heights, Zazzle. Bookmark the permalink. Thank you so much! 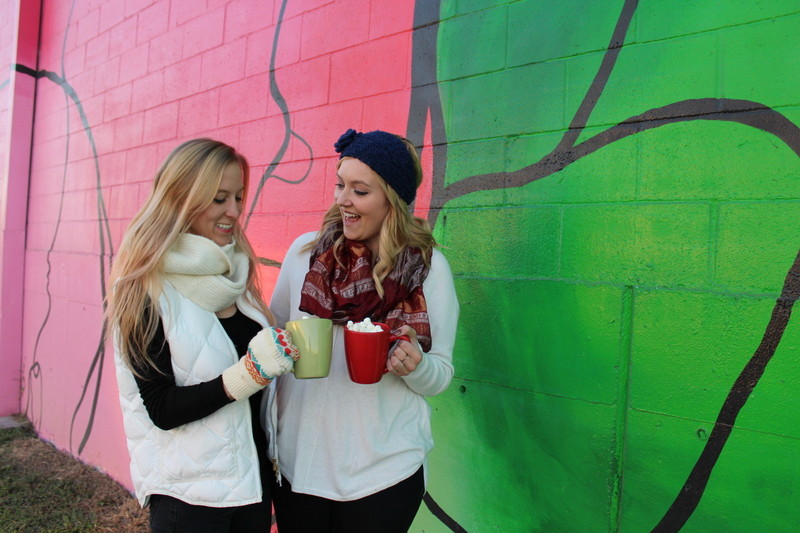 We had a great time shooting for this post! I love this blog. A fellow skimmbassador recommended this to me and I have found a lot of fun things to do also within my price range. Awesome job ladies. Hey Cindy! So glad you like it! We’re big into exploring Houston and showing people how cool it is to live here! I love the colorful walls! 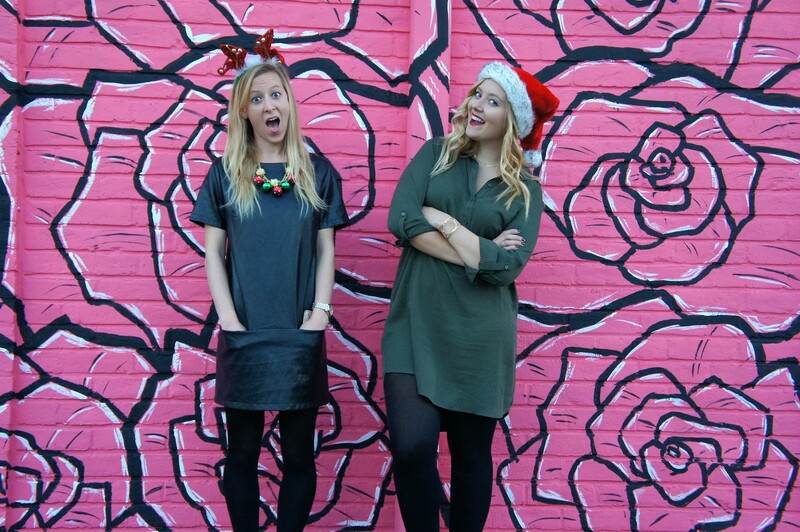 You two are beautiful models and took the most awesome Christmas photos!